WASHINGTON — Vice President Joe Biden knows he has issues. He'd turn 80 halfway through his first White House term at a time Democrats are drawn to new blood and he's a legend of the old political order as an energized left looks to upend it. So he's reportedly hatched on a possible solution: Announcing a younger running mate, perhaps former Georgia gubernatorial candidate Stacey Abrams, and pledging to serve only one term. Both are ideas long floated by pundits in previous elections that come with huge risks, but also potential rewards. But the moves would also lend a new clarity of purpose to Biden's campaign — one that no other candidate might be able to match. The former vice president could finally make explicit what's already an implicit argument for his campaign: A return to normalcy. "I think that we have to be careful about doing cute things in campaigns," House Majority Whip James Clyburn, D-S.C., a vocal Biden fan, told NBC News last week. "For as long as you can, you ought to travel the traditional route and hope that you can get to where you need to be. 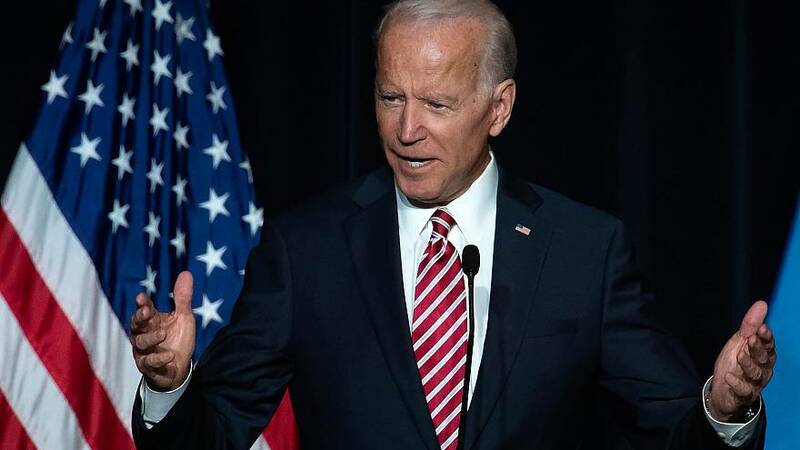 I think it would be a mistake for Joe Biden to come out — or any other candidate — and announce a running mate right out of the gate." Already, his recent speeches focus heavily on tributes to the last administration, reflections on the good old days of (relative) bipartisanship, and condemnations of Trump as a unique threat to democracy. It's clearly a message he believes in and one that distinguishes him from other Trump critics, who often treat the president as an extension of the modern GOP and the current political system rather than an aberration. So why not just say the quiet part out loud? In doing so, Biden might actually take a page from — oddly enough — Trump. The president eats, sleeps and breathes punditry. It's also in many ways his native speaking language. One standout trait of his 2016 run, especially early on, is that he would just name the thing people were talking about rather than couch it in some political euphemism designed to mask his intent. When it came time to take on Jeb Bush, for example, whose chief vulnerability was his link to two presidents GOP voters had reservations about, other candidates danced around the topic. Sen. Marco Rubio, R-Fla., spoke indirectly about how the time had come "to turn the page and elevate a new generation of leadership." But Trump said what people were talking about in the news and between voters themselves — the last Bush presidency ended with an unpopular war in Iraq and an economic collapse, the one before that included a tax hike conservatives hated, and both resulted in Democrats winning afterwards. In the general election, when pundits speculated that evangelical voters turned off by Trump's sordid personal behavior were torn by fears a Democrat would appoint pro-choice judges, Trump just repeated their arguments near-verbatim. "If you really like Donald Trump, that's great, but if you don't, you have to vote for me anyway. You know why? Supreme Court judges, Supreme Court judges," he said at one Iowa rally. Rather than try to refashion himself as a politician reborn who can lead the "new left," as he derisively put it in a speech last week, Biden could just tell voters what they might be thinking already: Choose old reliable Biden, and I'll put an end to the Trump presidency, and then someone else, preferably younger, a woman and a person of color can take it from there.